Coach Georges Leekens has described his Tunisia side's Africa Cup of Nations quarter-final defeat by Equatorial Guinea as "a shame for football". Tunisia were 1-0 up when they conceded a controversial penalty in the 91st minute and lost 2-1 after extra-time. "The referee has made a huge error. It's an injustice," said Leekens. "The result was forced. I can't accept it." The country's football chief Wadie Jary has resigned from the Confederation of African Football in protest. Leekens added: "In all my 45 years in football, 15 as a player and 30 as a coach, I've never seen anything like it, the result was forced. I can't accept it." It looked a harsh decision when Mauritian referee Rajindraparsad Seechurn pointed to the penalty spot in stoppage time, ruling that Ali Maaloul had fouled Ivan Bolado. Javier Balboa slotted in the kick and he went on to score the winner with a free-kick from 25 yards in the 102nd minute. "We played a good game, we've worked like mad men, we had a difficult first two weeks and we didn't deserve that," Leekens said after Saturday's match in Bata. "If they had played better than us, then I would accept defeat but I can't in this fashion. "My players gave everything and I am very proud. But I am very, very disappointed, not just for me but for Tunisia and my team. I think we deserved to go through but I wish Equatorial Guinea luck." While many neutrals may sympathise with Tunisia over the penalty awarded against them, the squad's reaction has damaged their reputation. The constant pushing and shoving between both teams that had been a feature of the match spilled over after Balboa converted the controversial spot-kick - within seconds, bottles of water were thrown from the Tunisian bench at their Equatorial Guinea counterparts. The final whistle was met by uglier scenes as at least five North African players chased referee Seechur, who struggled to keep control and had to be protected by security officials as emotions spiralled out of control. "There was a lot of anger because we were disappointed," Tunisia forward Wahbi Khazri told BBC Sport. "It's a scandal. The referee won the match and killed the game. It's unacceptable. I think we deserved to win but the referee was better than us today. "When I see things like that, I'm keen to go home. I think we're a long way from modern-day football in Africa." Equatorial Guinea were angered by the post-match focus on the penalty, feeling that the achievement of the tournament outsiders should have been celebrated instead. Ranked 118th in the world by Fifa, Equatorial Guinea - a team that was eliminated from the qualifying campaign last year after fielding an ineligible player - have used their reinstatement as hosts to great advantage. Now a side that agreed to stage the finals in November, after original hosts Morocco pulled out, can claim to be among the best four sides in Africa. "We are so happy to be in the semi-finals, and the key to our victory was passion," defender Rui told BBC Sport. "The referee is the boss on the pitch and if he says it's a penalty, it's a penalty. I don't care about it." Meanwhile, striker Luis Fabiani was keen to downplay the ugly scenes that marred the latter part of the game, as well as its denouement. "It's a very emotional game," he told BBC Sport. "It happens in football but you leave it on the pitch." 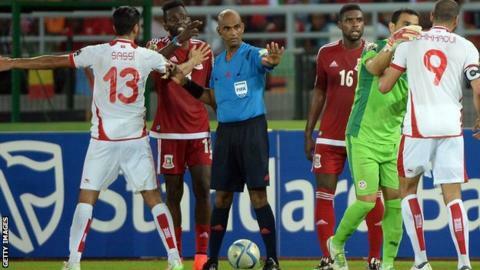 The Confederation of African Football has told the BBC it will await the referee's report before responding to the behaviour of both teams. Equatorial Guinea will play the winner of Sunday's quarter-final between Ghana and Guinea in Malabo on Thursday.